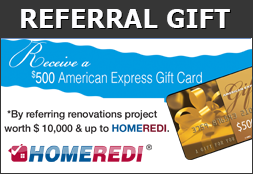 HOMEREDI provides a comprehensive list of services for Home Buyers like yourself who have just purchased their home and require a single vendor to prepare their new home before their actual move-in date. The same type of services are also available for Home Sellers who are preparing their home to be marketed to potential Home Buyers. Realtor also engage HOMEREDI on behalf of either Home Buyers or Home Sellers.